A swim team member at Eureka College, Reagan also worked as a lifeguard for seven years at home in Dixon, Illinois. Photo, circa 1927. (CNN) -- "Life is just one grand sweet song, so start the music." For much of Ronald Reagan's life, the words next to his high-school yearbook photo rang true. Lifeguard, athlete, movie star, governor, president -- there wasn't much that he did not do in his lifetime. The possibilities must have seemed endless for the little boy nicknamed Dutch growing up in the small town of Dixon, Illinois. "The world was one vast opportunity for Ronald Wilson Reagan," biographer Lou Cannon wrote in "President Reagan: The Role of a Lifetime." Ronald Wilson Reagan was born February 6, 1911, to John Edward (Jack) and Nelle Reagan in a second-floor apartment in Tampico, Illinois. His brother, John Neil, was two years older. Jack Reagan was a restless man. Not content with his job as a shoe salesman in Tampico's general store, he moved his family several times during Dutch's early life, always chasing the dream of a better job and a better life. When Dutch was nine, the Reagans settled in Dixon, a small town where Jack achieved a part of his dream -- partnership in the Fashion Boot Shop. But troubles continued for the elder Reagan. He went on to spend years fighting the vagaries of the economy and his own alcoholism. What little money Jack earned at the shoe shop was often squandered on drinking binges. He would disappear for hours or days at a time, leaving Nelle to make excuses for her husband and take in sewing to help the family's strained finances. But Dutch displayed even then the willful optimism that he carried through life, dealing with his family's poverty and the hardships they faced with the belief that there were better times ahead. Years later, Reagan recalled his early years in Dixon as idyllic. Summers were spent exploring the Rock River Valley; winters meant ice skating across the frozen Rock River. Dixon was where Reagan discovered a love of nature and the importance of small-town, traditional values. Nelle Wilson Reagan was a devout Christian who, despite her own trying circumstances, devoted her self to the service of others. Having allowed Neil to be baptized in the Roman Catholic faith of his father, she encouraged Dutch to join her church. At age 12, Dutch was baptized by the Disciples of Christ, a Midwestern Protestant group that preached temperance, salvation through good works and the idea that God has a plan for all things. The church became a focal point of Dutch's life. He went to Bible classes, acted in church plays directed by his mother and helped clean and repair the church. Dutch carried his early church teachings with him throughout his life. Many years later, he would recite hymns he learned as a boy and share with others his belief in God's unerring plan. From his father Reagan inherited personal charm and a gift for storytelling. Despite his own employment difficulties, Jack taught his sons the value of ambition and hard work. As he grew older, Dutch set his sights on the all-American life, and by all accounts he succeeded. At Dixon High School, he was outgoing and active, serving as president of the student council and excelling in football, basketball and track. It was clear early on that the young Reagan loved to perform. He participated in church skits and studied drama in high school, starring in several school plays. But the most important moments in Dutch's Dixon years came at Lowell Park on Rock River. There, for six summers, he worked seven days a week as a lifeguard, commanding center stage on his stand. Dutch reportedly pulled 77 people from the river's swift currents over the years, putting a notch in a log for every one. 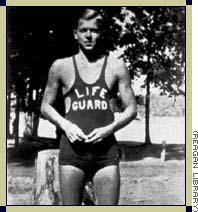 Decades later, Reagan would remember his lifeguard days at Lowell Park as the happiest of his life. After high school, Reagan enrolled in Eureka College, a liberal arts college run by the Disciples of Christ. 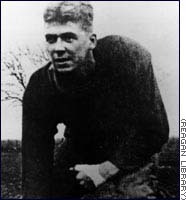 Strikingly handsome, poised and athletic, Reagan quickly earned a name at the small school, which had fewer than 250 students enrolled when he arrived in 1928. He played on the Golden Tornado football team, became captain of the swim team and acted in college plays. It was at Eureka, that Reagan first imagined becoming a movie star, a dream he apparently kept to himself. While dreaming of Hollywood, Reagan got his first taste of politics in college, first serving in the school senate and later becoming student body president. As a freshman, the young New Deal Democrat, who would later become a conservative strike-buster, helped lead a campus strike protesting plans to cut faculty. In the process, the college president resigned and Reagan got an early and enticing brush with the spotlight. "For the first time in my life, I felt my words reach out and grab an audience, and it was exhilarating," Reagan wrote in his autobiography. For all of his achievements, Reagan was an ordinary guy to his peers. "He was just one of us," his classmate Wilfred "Tubby" Muller recalled more than 60 years later in an interview with CNN. "It was a bigger surprise to us, probably than the people who didn't know him, to see how well he succeeded." At college, Dutch supplemented his scholarship and summer lifeguarding salary by waiting tables at his Tau Kappa Epsilon fraternity house. He also washed dishes for a women's dormitory. Back in Dixon, Jack's Fashion Boot Shop fell victim to the Depression in 1930, sending him off to work as a traveling salesman. Nelle took a job at a dress shop, and the family subleased a portion of their house to raise much-needed money. When they could no longer afford to rent the house, the family moved to a smaller apartment. Jack lost his job soon after, and Reagan secretly sent grocery money to his mother. Later, when Jack developed a heart problem, the younger Reagan helped support his parents and sent his brother through Eureka College. "He was a very conscientious boy and always tried to do the right thing," said Reagan family friend Marion Foster. Reagan's father, one of the few Democrats in town, was appointed to administer some of Franklin Roosevelt's new federal relief programs in Dixon, giving his son a none-too-encouraging glimpse at the workings of federal government. Reagan later recalled that welfare workers undermined his father's efforts, encouraging people not to take the work offered through the Works Progress Administration, but instead to rely on other benefits. "I wasn't sophisticated enough to realize what I learned later: The first rule of a bureaucracy is to protect the bureaucracy," Reagan wrote. Challenging that idea became one of his central political tenets. 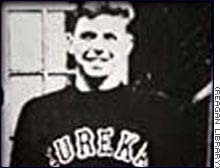 Reagan graduated from Eureka in 1932 with a degree in economics and sociology. He was a 21-year-old man with dreams of stardom in the depths of the Depression. 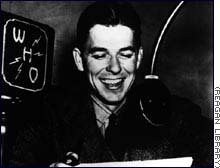 Although it was the heart of the Depression, the persistent Reagan found work as a radio sports announcer in Davenport, Iowa, and then Des Moines. He spent five years in radio, perfecting his speaking style. An often repeated story recounts how he delivered play-by-play accounts of Chicago Cubs baseball games from his booth in Des Moines. His colorful reports were based solely on telegraph reports of the games in progress. But his dream of Hollywood stardom persisted. In 1937, while in California to cover the Cubs' spring training, Dutch traveled to Los Angeles for a screen test. He was offered a seven-year Warner Brothers contract, with one proviso: "Dutch Reagan" wasn't right for the silver screen, he was told, but "Ronald Reagan" looked just fine. So Ronald Reagan went back to Des Moines, packed all his possessions into a Nash convertible, and headed off for Hollywood.